Baking is all about sharing. Sharing the recipes, sharing techniques, and most definitely, sharing what you’ve made. Today’s offering is all about the most divine biscuits, perfect for the early fall weather we are having here in the Northeast. I couldn’t wait to share them with you. This recipe uses self-rising flour as an ingredient. I like to use King Arthur’s Self-Rising Flour. It’s wonderfully light and includes non-aluminum baking powder and salt. It’s absolutely perfect for biscuits, pancakes and muffins. I always have a bag of it in my kitchen because I can guarantee fluffy perfect results whenever I use it. 1. Place an oven rack in the center of the oven and preheat the oven to 425*F. Line a baking sheet with parchment paper and set aside. 2. Prepare the apples: Place butter in a medium skillet over medium heat to melt. Add the apple slices, cinnamon, and brown sugar. Toss with a wooden spoon until all of the apples are coated and the sugar is melted over the apples, about 2 to 4 minutes. The mixture will be warm and glossy, but the apples won’t be cooked through. Remove from the heat and set aside. 3. Make the biscuit dough: Place flour in a medium bowl and add the cold butter pieces. Using your fingers or a pastry cutter, quickly break down the butter into the flour. Some of the butter bits will be the size of oats, some the size of small peas. Stir in the granulated sugar. 4. Create a well in the center of the flour mixture and add 2/3 cup buttermilk. Stir the mixture together until it is well moistened and holds together well. Biscuit dough should be soft and moist. Add the remaining buttermilk as needed. A shaggy dough that doesn’t quite come together. 5. Use regular all-purpose flour to generously dust a work surface.Turn the dough out onto the floured surface and use your hands to gather it into a ball and gently pat it into a small rectangle. Use a rolling pin to gently roll the dough into a rectangle that is 1/2 inch thick, and about 7 x 10-inches. 6. Arrange cooled apples in a single layer over half of the rolled out biscuit dough. Fold the bare side of the dough over the apples and gently press the edges to seal in the apples. Use your hands to nudge/ encourage the dough into a 6 x 8-inch rectangle if the edges are looking a bit rounded. 7. Use a sharp knife to slice the dough into a total of 12 biscuits. Flour the knife a bit if it gets too sticky. Use a spatula to place each biscuit onto the prepared baking sheet, about 2-inches apart. 8. In a small bowl, whisk together sugar for topping, cinnamon, and salt. Brush each biscuit top with beaten egg and sprinkle generously with the cinnamon sugar mixture. 9. Bake for 12 to 14 minutes until the biscuits are risen and golden brown. Remove from the oven and serve warm, or cool completely before storing in an airtight container. 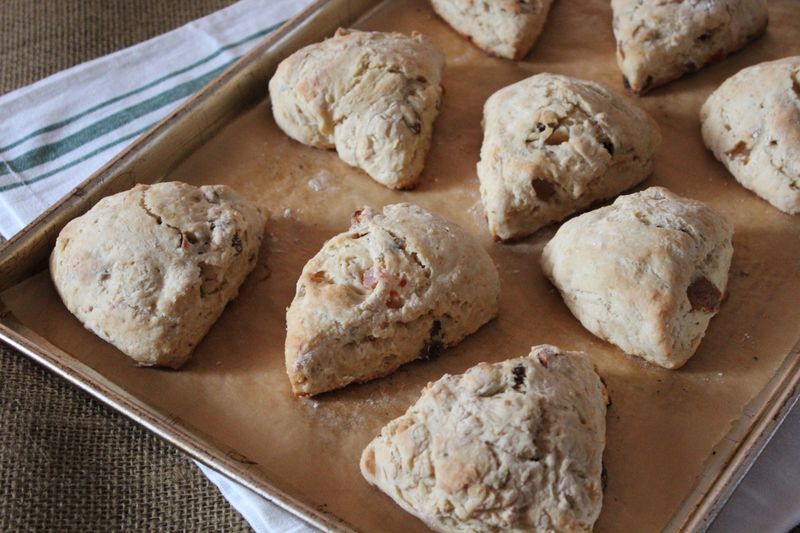 Biscuits are best served the day they are made or the day after. They may be rewarmed in the microwave. Tender and light….you won’t be able to stop at just one! These are the best breakfast muffins, ever. You read that right. These muffins are for all of you who can’t make up your mind in the morning. These muffins are like four breakfasts rolled into one: they are a stack of pancakes, a bowl of oatmeal, bacon and eggs or just a muffin, thank you very much. Just when I’m trying to avoid eating greasy things like bacon, or pancakes slathered with butter and maple syrup, here I go combining them. No, I’m not trying to kill you, or me either, I’m just full of contradictions. But there is meaning in my madness: the oatmeal is in there for a purpose. Oatmeal provides fiber, and the fiber cleanses out the greasy bad stuff. Oh, the power of oatmeal. It’s feeling the weight of responsibility on its shoulders. But I know it can handle it, else I wouldn’t be using it. Maple syrup? It’s there to take the place of sugar. You know, sweeten things up a little. And living in maple syrup country as I do, I try to include it when ever possible. Bacon? Well what can I say about bacon that hasn’t already been said by a million other people. Bacon makes everything better. That’s all there is to it. You must try these muffins —- and think how healthy they are for you! Yield: This recipe makes about 17 -18 muffins. It can easily be halved for a yield of about 8-9 muffins. A trio of great ingredients: maple syrup, oatmeal and bacon. 1. Preheat the oven to 350*F. Line muffin tin(s) with paper liners and set aside. 2. In a large bowl, combine milk and oats, then let it sit while you cook the bacon to allow the oats to soften. 3. In a separate large bowl, whisk together the flour, baking powder, salt and sugar. 4. Whisk maple syrup, melted butter, and egg into the oatmeal mixture. Lightly stir the wet ingredients into the dry ingredients along with the bacon. 5. Spoon the batter into the prepared muffin cups until each is about 3/4 full. Bake for 20 – 25 minutes until they are golden brown and a toothpick inserted into the center comes out clean. Transfer to a cooling rack and brush the tops with the reserved maple syrup, using a pastry brush. Brush the tops with maple syrup while still warm from the oven.